This model produces an oscillating output but this result has not been checked against the publication. ValidateCellML verifies this model as valid CellML, but detects some unit inconsistencies. Intracellular Ca2+ ions are essential for the initiation of cellular events such as the fertilisation of eggs, muscle contraction and hormone and peptide secretion. 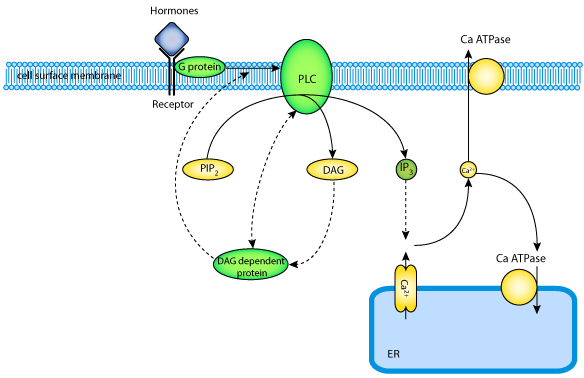 In excitable cells such as neurons, an increase in intracellular Ca2+ is brought about by the Ca2+ channels in the plasma membrane when these channels open during depolarisation, permitting extracellular Ca2+ to enter the cell. By contrast, in non-excitable cells Ca2+ is supplied mainly by internal stores. These stores release Ca2+ when neurotransmitters and hormones engage in the phospholinositide signalling pathway. Oscillatory signals in [Ca2+]i in non-excitable cells are frequency encoded. These patterns are similar to action potential responses observed in excitable cells upon stimulation. A model exclusively studied in this paper is based on the receptor-operated model of Cuthberson and Chay (1991) (see below). The essence of this model is that the resting period between the Ca2+ spikes are timed by the build up of GTP-binding proteins combined with positive feedback effects and co-operation, leading to the sudden activation of phospholipase C (PLC). Activated PLC converts phosphatidylinositol 4,5-bisphosphate (PIP2) into two second messengers, diacylglycerol (DAG) and inositol 1,4,5-triphosphate (IP3), which releases Ca2+ from intracellular stores (see below). The raw CellML description of the intracellular Ca2+ spikes in non-excitable cells model can be downloaded in various formats as described in . 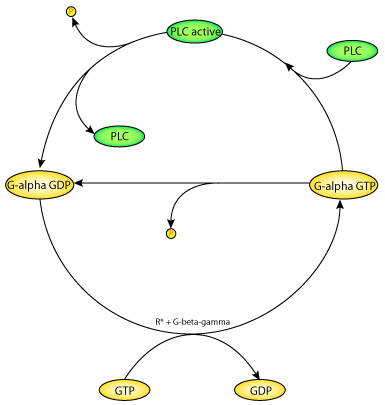 A schematic diagram of the Bourne-Stryer mechanism, PLC acts as a protein activating G-alpha-GTP. PLC is an effector which is activated when bound to G-alpha-GTP. The exchange of GTP for bound GDP is catalysed by the hormone-receptor complex R*, with the help of the G-beta-gamma subunit. Hydrolysis of the bound GTP brings the G-protein back to the inactive state. GTP hydrolysis by the G-alpha_GTP complexed with PLC is much faster than that of G-alpha-GTP alone. The model is based on these four reaction steps. The Ca2+-phosphatidylinositol signalling pathway plays a major role in transmembrane signalling in a large number of different cell types. In this pathway hormonal stimuli lead to the activation of G-proteins as an effector system. This initiates PLC activation and the subsequent formation of DAG and IP3 which triggers the generation of repetitive [Ca2+]i spikes varying in frequency, amplitude and duration depending on the strength and the type of the extracellular agonist. Derived from workspace Chay, Lee, Fan, 1995 at changeset 4df2a542a083.